Elizabeth Ann Bayley-Seton was the first native-born American to be canonised a saint. After her conversion to Catholicism she became a religious sister and did great work as an educator and social worker. Elizabeth Ann Bayley-Seton was the first native-born American to be canonised a saint. At nineteen she married a wealthy merchant William Magee Seton, but after ten years of happy marriage and motherhood, her husband died. She then converted to Catholicism, became a religious sister and did great work as an educator and social worker. Patrick Duffy tells her story. Elizabeth came from a prominent New York Episcopalian family. Her father Dr Richard Bayley was a physician and professor of anatomy at King’s College, which later became Columbia College. Her mother was the daughter of the rector of the Episcopal Church of St Andrew’s on Staten Island. She died when Elizabeth was only three. Elizabeth was brought up by her father and from him she inherited a concern for nursing the sick, especially the sick poor. At the age of twenty she married William Seton, a wealthy shipping merchant, and they had five children, two boys and three girls. 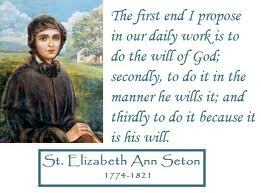 Elizabeth founded a society for the relief of poor widows with sick children. William lost many of his ships in the Napoleonic War and subsequently developed tuberculosis. In 1803 William and Elizabeth went to Italy and stayed with some Catholic friends at Livorno, but he died after six weeks. On her return to New York, Elizabeth, despite strong opposition from her Episcopalian family and friends, determined to become a Catholic. She was received into the Catholic Church in March 1805 and confirmed by John Carroll, bishop of Baltimore in 1806. Elizabeth started a school for boys in New York and then was asked by a priest from Baltimore to open a school for girls there in 1808. This school did well and Elizabeth gathered a group of women with whom she started a religious community at Emmitsburg near Baltimore, based on the rule of St Vincent de Paul. This community became known as the Daughters of Charity of St Joseph. Elizabeth devoted her attention especially to the poor, but also laid the foundation of the parochial school system in America, training teachers and preparing text-books for use in the schools. 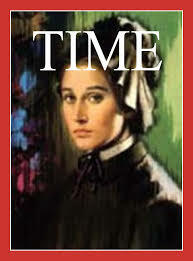 She also opened orphanages in Philadelphia and New York city. Elizabeth died at Emmitsburg on 4the January 1821. She was beatified by Pope John XXIII in 1963 and canonised in the presence of 1,000 nuns of her order in 1975. Her religious community has spread to South America, Italy and missionary countries. At her canonisation Pope Paul VI named the extraordinary contributions she had made as a wife, mother, widow and consecrated nun.